No Vendor Chain Taken back to brick in 2014 and refurbished throughout this mid terrace cottage will appeal to a buyer looking for a home with no maintenance requirements Whilst retaining it's original charm the layout over four levels comprises a lounge, dining room and a modern fitted kitchen with French patio doors. First floor landing, two bedrooms, a polar white bathroom and a fixed staircase leading up to bedroom three. 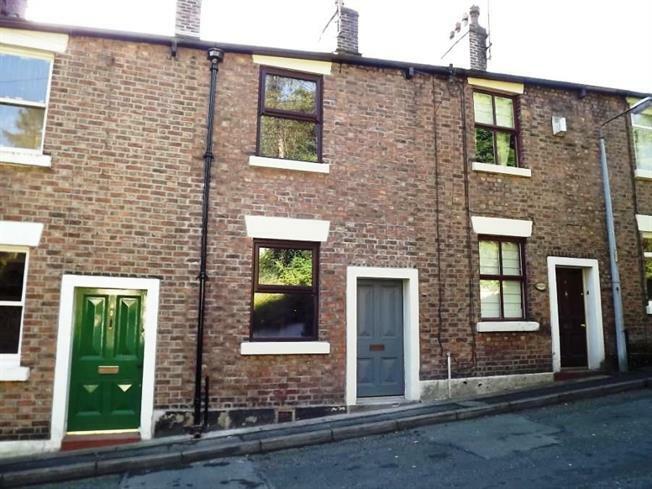 Set in the heart of the village Disley within walking distance of all public amenities/transport links and train station (Manchester - Buxton line). Four panel main entrance door. Single radiator. Staircase leading to the first floor accommodation. Courtesy light. UPVC double glazed window to the front elevation. Double radiator, TV and telephone points. Recessed electric coal effect log burner. Square fetaure opening leading to the dining room. UPVC double glazed window to the rear elevation. Double radiator. Banister rail and staircase leading down to the kitchen area. Exposed timber floor. UPVC double glazed French patio doors to the rear elevation. Fitted matching range of wall, base and drawer units complete with rolled edge worktops. Stainless steel one and a half bowl and single drainer unit with mixer tap. Combi gas central heating boiler. Four ring halogen hob complete with an extractor and light hood over. Integrated electric fan assisted oven. Partially tiled walls. Plumbing for an automatic washing machine. Space for a tumble dryer. Spindled staircase leading up to the dining room. Double radiator. Halogen down lights. Double radiator. Banister rail. Staircase leading to the third floor bedoom. UPVC double glazed window to the rear elevation. Single radiator. Exposed timber floor. L-shape design Measurements taken at the widest points. UPVC double glazed window to the front elevation. Single radiator. Exposed timber floor. Three piece matching suite comprising a low level WC, pedestal wash hand basin and a kidney shaped shower bath with curved shower screen. Double radiator. Extractor fan. Partially tiled walls. Electric shaver point. Chrome fittings and attachments. Double glazed Velux style window. Two Velux style double glazed windows. Exosed timber floor. Two single radiator. Access to two under eaves storage areas. Vaulted ceiling. Designed to be easily maintained with two stone paved patio areas, flower beds and coloured gravel stones. Small selection of shrubs and trees.